Hey everybody! This time Jeremy Hogan is my guest. 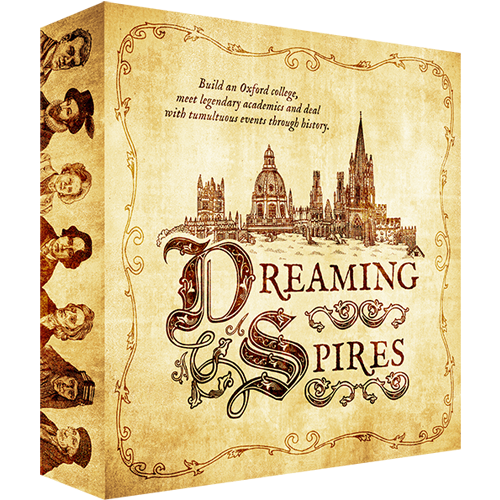 Jeremy is the designer of Dreaming Spires, a new euro style game about building Oxford University. Dreaming Spires is currently on Kickstarter and has been funded. Go over here – http://www.kickstarter.com/projects/949153718/dreaming-spires – and support it now. Tom: What do you want to tell us about yourself? Jeremy: Hi, thanks for interviewing me and taking the time to learn about Dreaming Spires! My name is Jeremy Hogan, I live in London, UK, where I work as a game designer in the video game industry and design board games in my free time. Tom: Jeremy, you work in the video game industry. For many readers this seems like a dream job. What’s it like working in that industry? Jeremy: I work at Beatnik Games, which is an indie studio in central London with just 10 employees. We have a really experienced team and everyone’s great to work with. I really enjoy the indie environment. There are downsides but the efficiency of a small team means you can make great games in a relaxed and friendly atmosphere, which hardly feels like work at all! Tom: What is a typical day at work like? What do you do? I ask because I don’t know and would like to peer into the work life at a video game studio for a second. Jeremy: I’m the lead designer on our current project so I mainly write-up the design for sections of the game then the team discusses them and when a consensus is reached, I incorporate suggestions and add a section to the Game Design Doc. I also play the game a lot; our current project is still under wraps but it has a competitive multiplayer element so it’s great to play-test. Tom: What is your gamer history? What game got all this started? Jeremy: Haha, good question! There have been so many! I played a lot of the now much-maligned Monopoly and Risk as a kid, also Magic. Then, at university, we discovered euro games and we’ve never looked back! Now I play a lot of historical wargames as well as some lighter stuff and do loads of playtesting! I also play a lot of video games and love strategy games like Civilization and indie stuff like FTL. Tom: Tell us about Dreaming Spires. Jeremy: I’ve been working on Dreaming Spires for 2 years now and it’s been so satisfying to finally launch it on Kickstarter. We were optimistic about it but funding in 3 days was amazing! We set a low target because we wanted to be sure that we would succeed but the support has been incredible. Tom: How does the game work? Jeremy: It’s for 3-5 players, who each begin in the medieval era with a blank slate and build their own Oxford college. The buildings you choose and how you place them will give your college benefits, which allow you to attract the great scholars of Oxford’s history. Tom: That is a very unusual theme though I think intriguing. Where did it come from? Jeremy: I studied at Oxford and really fell for the place. During my interviews, I remember walking around this misty quad in the evening, entranced by it all, thinking so many people must have done the same year after year. Tom: I think the theme is interesting especially ‘working with’ all the great scholars that have been at Oxford. But playing devil’s advocate for a second, the theme on the surface feels a bit dry. I can hear some gamers now “building a college, Oxford to boot. how exciting.” How are you combating the perception? 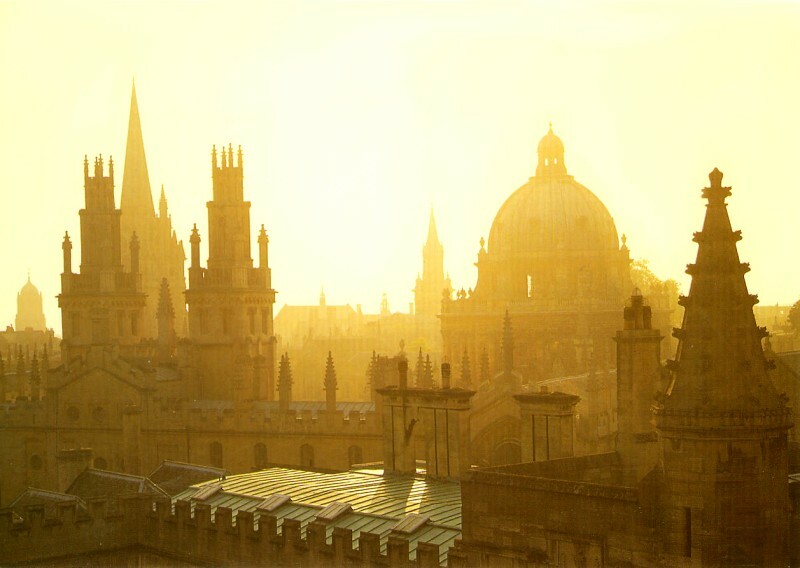 How are you getting people excited about Dreaming Spires? Jeremy: I see how you might imagine that it’s a bit dry but the history of Oxford is far from it! The event cards tell of burnings at the stake, secret societies, town vs ‘gown’ riots, civil war and all sorts of amusing anecdotes. Plus building your college up from nothing gives you the satisfaction of creating something. Tom: Ok, you had me at secret societies. Now I’m seeing it. I guess it takes someone who knows the history to tell the stories to get us excited about it. And thinking about it more than just on the surface. This is one of the oldest and most prestigious universities IN THE WORLD. How can it not have an interesting history. Jeremy: Exactly, its seen every famous era of English history from a unique vantage point as a political lightweight but an academic powerhouse. 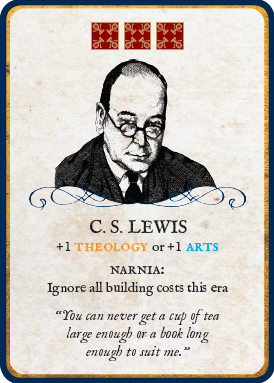 And yes the scholar cards are just fantastic, they have it all: beautiful illustrations, rich history, their own quotes and all set out beautifully by Jessie, our graphic designer. They’re like a really good Magic card, you just want to hold them! Jeremy: The scoring mechanic is interesting because I don’t think its been used before (or at least I’ve never seen it). Players increase the reputation of their Fellows, Students and Tradition and then also 7 subjects but these 10 scores are arranged on a 7×3 table and players are aiming to have the highest combined score in each box of this table. For example, the top-left box is the intersection of the Politics reputation track and the Fellows reputation track – your score for this box is your combined score in Politics and Fellows. Tom: That is a very interesting idea. Playtesting. How extensive and how long did it take for Dreaming Spires? Was it helpful? Did you get a lot of good feedback? Any major changes because of it? Jeremy: I have played Dreaming Spires countless times over the last 2 years. The game has evolved a lot but the central idea of building a college out of building tiles, which attract the famous scholars and then dealing with historical events is the same. Tom: Let’s talk about the art briefly. Who is your artist? Jeremy: Our graphic design was done by Jessie Price. We met in London through a friend and Jessie introduced Amber Anderson, our illustrator. I have been really lucky to have the help of two such talented artists! Jeremy: Probably not being too competitive but I am not always great at that! Definitely patience and also the ability to resist analysis paralysis! Jeremy: I thought Here I Stand was incredible – so much research! Then I found out the designer, Ed Beach, also worked on Civilization V and I really swooned, what a CV! I love Martin Wallace as well, A Few Acres of Snow was genius! Plus he sent me a very kind reply to an email I sent many years ago asking for advice about getting into the board game industry, which was very nice of him. Jeremy: Well I just got back from my stag (bachelor party) in the wilds of Wales, where we played a lot of games and we finally got a chance to play Britannia, which I absolutely loved. You play on a map of Britain from the first Roman invasion to the Norman Conquest in 1066AD. Each player controls a series of people like the Saxons or the Picts, there’s 17 in total. The history is absolutely embedded in the mechanics; the factions are so nicely balanced that your game will follow history to an impressive degree, it’s very clever. Tom: That’s Lewis Pulsipher’s game right? I’ve heard good things about it. Jeremy: Yes that’s right, I’d really recommend it. You sit around a map of Britain and see each people wax and wane. It’s long but they have some shorter scenarios if you don’t have a whole day. The newer Fantasy Flight editions (2005+) are beautiful and with loads of player aids, etc which make it easier to pick up. Tom: I will add it to my BGG want list. What game surprised you and how? Jeremy: I’ve been playing a lot of Command & Colours Napoleonic recently and have been surprised at the difficulty I’ve had adapting from C&C Ancients. I think it’s a great game but I’m naturally quite defensive in games and while that worked for me in Ancients, it really hasn’t in Napoleonic! I’m impressed by how Richard Borg has made it really reward players for daring attacks! Tom: What are you currently reading? Jeremy: Recently I’ve been researching colonial India for a game idea so read The Last Mughal by William Dalrymple, which is about the Delhi Mutiny, it’s excellent. Jeremy: I liked Tinker, Tailor, Soldier, Spy, the cast was brilliant, I wasn’t too sure about the ending though. I also just watched Generation Kill, which I thought it had some brilliant performances. Tom: Is there a particular historical period or subject you feel is underrepresented in game themes? Jeremy: I love when games cover underrepresented themes, I actually think board games do a much better job of representing unusual themes than most other media. I would love more games about people as opposed to eras and places – not an easy task I know but I think a sort of biographical game of someone really interesting could be great. Tom: That is an excellent answer. 1960: The Making of The President is a good example of this I think. It would be cool to see a game about the Tesla/Edison feud. Or a Teddy Roosevelt game. Someone should get on that. Jeremy: Yes exactly! Or how about Woodrow Wilson, Lloyd George and George Clemenceau at the Paris Peace Conference after World War 1. Two huge empires, the Ottoman and The Austro-Hungarian, had fallen and they had to put Europe back together again while looking out for their nation’s interests. There must have been some tense moments! Tom: Ok, so I expect to see a new game from you with this theme. And you inspired me. I was thinking about underrepresented times or events myself and had an idea for a race game with a Lewis & Clark theme. Two player – one player is the Lewis & Clark expedition. The other is a Russian expedition. Both are trying to find a water route from the middle of the North American continent to the Pacific. They are just working in opposite directions. And there is some historical evidence/stories that the Russians were attempting to establish a foothold in the Northwest Pacific. So it has a grain of truth there. Oh, and a Davy Crockett game of some sort that isn’t just The Alamo. Jeremy: Yes please! Check out our Website, Facebook and Twitter but most of all please come and support The Dreaming Spires Kickstarter Campaign ! Tom: What is something that the general public would not know about you? Jeremy: I love pizza, I make my own and generally take it far too seriously! Jeremy’s company, Secret Games Co., is not going to be so secret anymore. Dreaming Spires is going to be a big hit. As I mentioned, the game has funded and will be published. 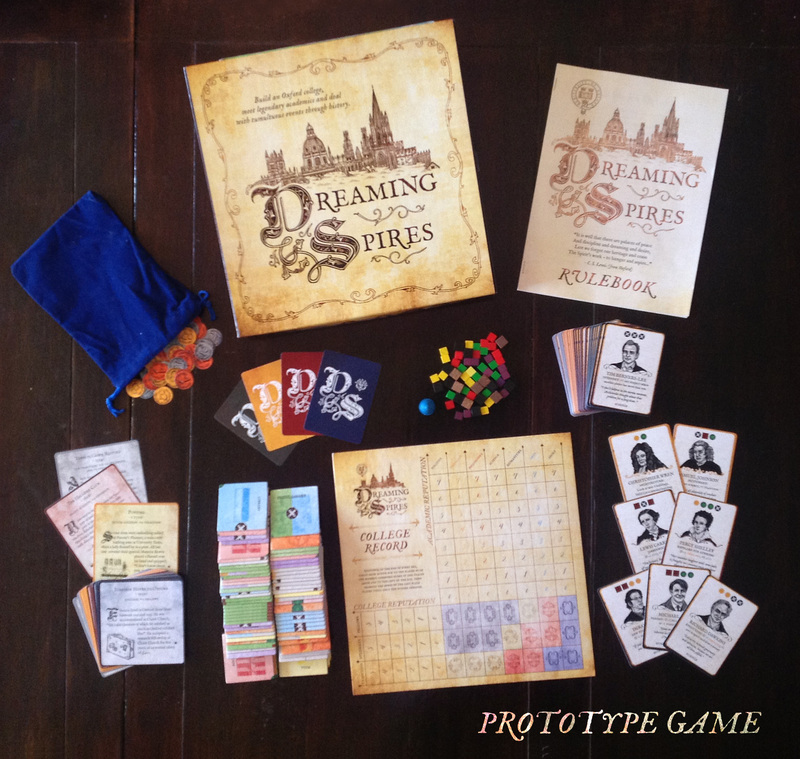 So be sure you check it out and give it some support right here – http://www.kickstarter.com/projects/949153718/dreaming-spires or you can get there from the Game Salute site. Filed under: Dreaming Spires, game salute, Jeremy Hogan, Secret Games Co.